There are very few people on this earth who really move you to a great extent just by their mere presence. 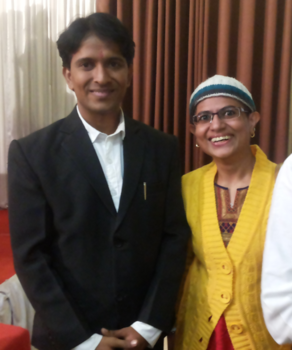 I met Ashok Munne one of such great personality in JCI Nagpur Green City Installation Ceremony on 10th January 2016. Ashok lost his right leg in a train accident where his leg was trapped under the wheels of the train. He had two unsuccessful operations below the knee in the government hospital. Ashok lost lots of weight and suffered from severe asthma which made walking from one place to another a tedious task. Then life took a turnaround and he started working on himself and took destiny in his own hands. The real life narration of Ashok brought tears to my eyes. I could feel how much he suffered but then he never lost hope. He learned yoga and stopped taking medicines. He read motivational books and started making himself fit. With just one real leg and the other artificial leg, Ashok became the first Physically Challenged Indian to Summit Mera Peak 21,247 Ft, Leh-Ladakh Bike Ride 3,000 KM, Himalaya Kugti-pass 16,700 Ft and many more. He is Martial Arts - Black Belt. He received Shivraj Pratisthan Gaurav Award 2012. He has so many laurels to his hat but you will not feel even 1 % pride in this man. He is very down to earth man with a smiling face. I approached him for a photograph when he stepped down the dice after completion of installation ceremony. He readily agreed for a snap with him. I even took his visiting card. You don’t get to meet people like these every day in your life. There are only some days in your whole lifetime that you get to meet such great people who inspire you. I was very much touched by his humbleness. We read in books about extraordinary determination, discipline and focus towards goals but Ashok Munne was the real implementation of all these. He is a very athletic and disciplined man. He is from Nagpur, Maharashtra. We all Nagpurians are proud to have such a great man from our City. Friends support Ashok Munne in his Everest Mission 2016 by helping him in all possible ways. I would request every Indian to contribute for him.